not greedy. just curious: Sausage pasta. This is very tasty and i urge you to make it. It is a Nigel Slater recipe and one of my favourites. Chop the garlic finely and saute it until golden brown, add the sausage meat which you will have removed from the sausage skins, add to the garlic and allow to brown. It is good if the meat sticks to the base of the saucepan as the goo is the tasty stuff. Once the meat is browned add the vermouth and agitate the goo off the bottom. When this is done add as much creme fraiche as you want, you can use 0% fat yoghurt if you want to be healthy. It's good to have lots of sauce as it is pretty darn tasty. 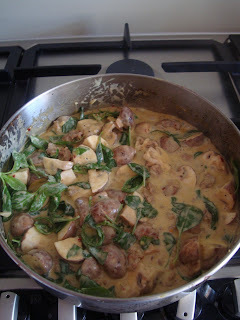 Turn the heat down and mix the creme fraiche and meat together, add the chilli flakes as much or as little as you want, then add the quartered chesnut mushrooms and cook until mushrooms done. I throw the basil on at the end before serving. I usually have this with Conchiglioni pasta so the yummy sauce and meat get inside. Be sure to have some bread handy to mop up the sauce as you will want to clean the saucepan of every last drop of it!